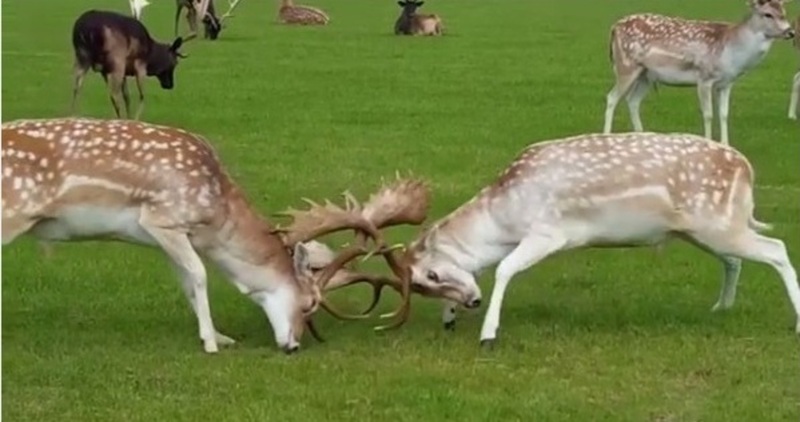 Trophy hunters are taking aim at the Phoenix Park’s 500-strong herd of fallow deer. But it’s not antlers they’re after. 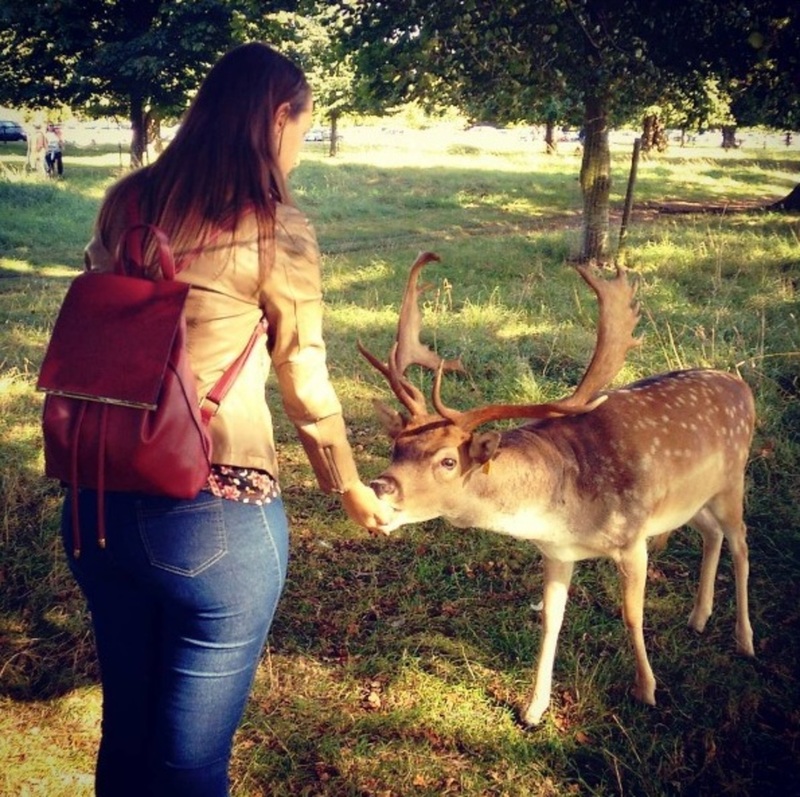 A trawl through Instagram posts has found more than 380 showing people close to deer in the park since the start of September, with 132 of those showing people feeding animals or luring them with food. That comes to an average of 19 posts a day showing visitors ignoring park advice to keep at least 50 metres back from the deer. The most popular foods on offer are carrots or apples, but posts show people feeding chocolate, cream crackers, porridge oats, sliced bread, bananas, and even crisps to deer. It’s three weeks into rutting season for the herd. In September and October, does start to come into heat for a day or two at a time. Hormonal bucks become more aggressive as they fight for the right to mate – and people are warned to stay well away from the animals. But that has done little to deter people in search of that up-close experience with nature. In one video shot by a user on 3 September, two bucks lock antlers just metres away from the person shooting the video. 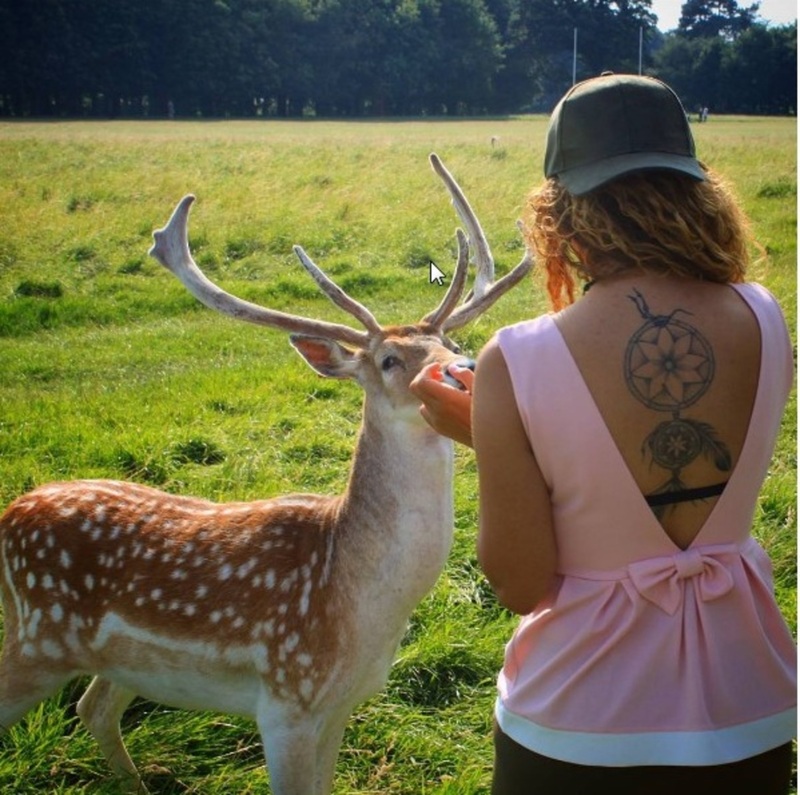 Scroll through the main location tag for Phoenix Park on Instagram, and you’ll find a lot of deer posts. It’s easy to see why: they’re undeniably cute and mostly docile – what could be more innocent than feeding them? What’s the harm in dabbing with deer? Photo courtesy of Saray Medina. But among the avalanche of Bambi moments, there is more worrying material. A deer accepts a carrot from out of someone’s mouth in one post, but another is happy to eat a carrot presented by a young man through the fly of his jeans. 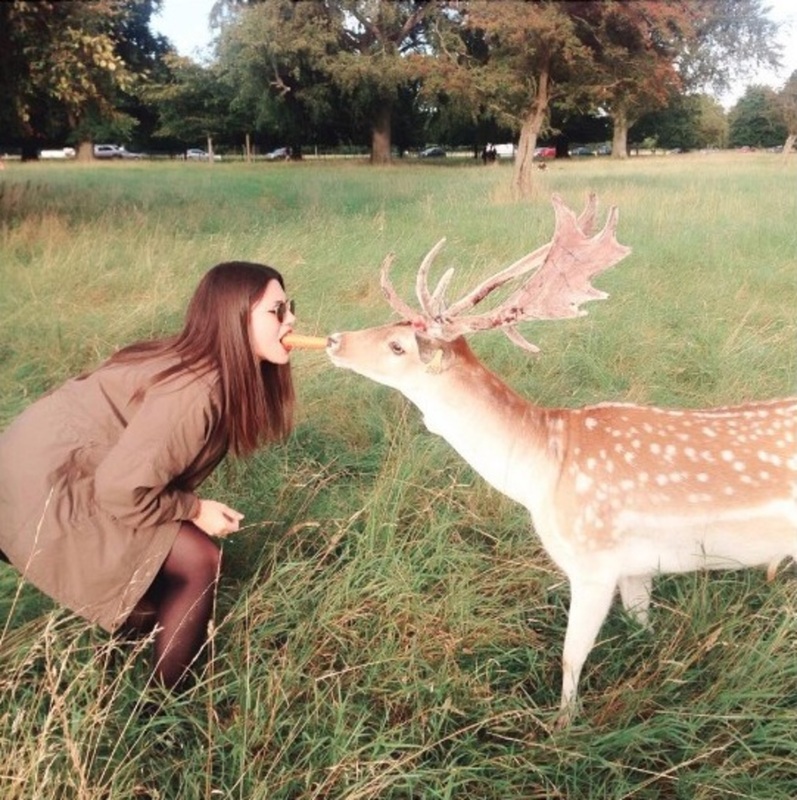 Dublin-based model Brittany Mason fed carrot sticks to a buck on 1 September in a post that went out to over 58,000 followers – with a tag for yoga-wear brand Lululemon. In the description, she urged followers to follow her on Snapchat to see more deer pictures. The DSPCA described the volume of posts as “shocking”, adding that getting so close to the deer was dangerous for people and animals alike. “The deer aren’t necessarily going to be eating things that are going to be good for them. 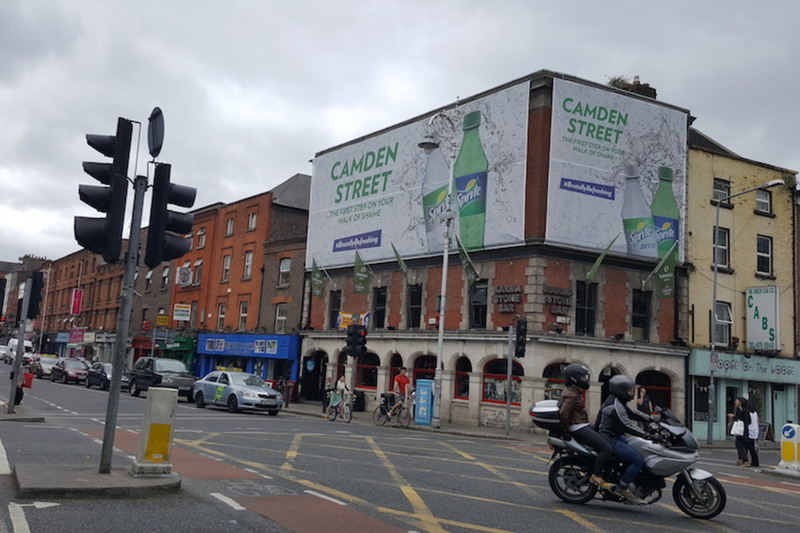 They’re not going to be getting the correct diet,” said Gillian Bird, education officer with the Dublin Society for the Prevention of Cruelty to Animals (DSPCA). “You wouldn’t know what a badly digested apple or carrot cold do to a deer. They are ruminants. That means they eat grass and leaves and bark – they don’t go digging for carrots,” Bird said. But it’s not just the content of the food that could cause long-term harm to the animals, Bird said – it’s the effect on their behaviour. But deer are now doing just that. Mallika Chaudhary, who blogs at An Old Sole, was one of the Instagram users who went to see the deer this month – but she says a fawn approached her looking for food, and not the other way around. “I saw many people feeding bread to them but did not do the same for two reasons – I didn’t think that it wold be allowed, and I didn’t think flour-based food was good for them,” she said. “They were very shy and would only go to the people who were luring them with food. It was when I took a bite of an apple while we were standing there enjoying the sight, that a baby deer came towards me and started sniffing at my hand. 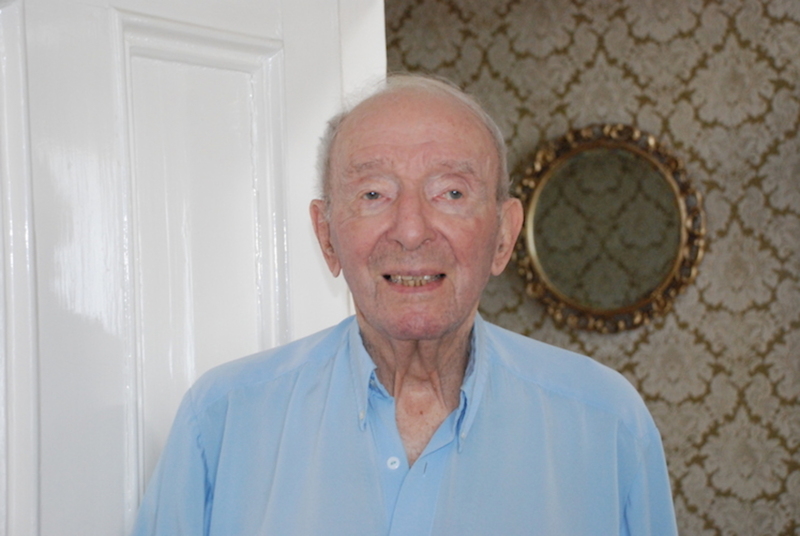 “I was a bit scared but he seemed harmless. I figured that apple can not be bad for him and fed him the remaining fruit out of my hand,” she said. Chaudhary’s experience is echoed in several posts from this month showing deer approaching or following people. Reactions range from bemusement at finding a deer who likes Galaxy bars to fleeing a curious buck in terror. 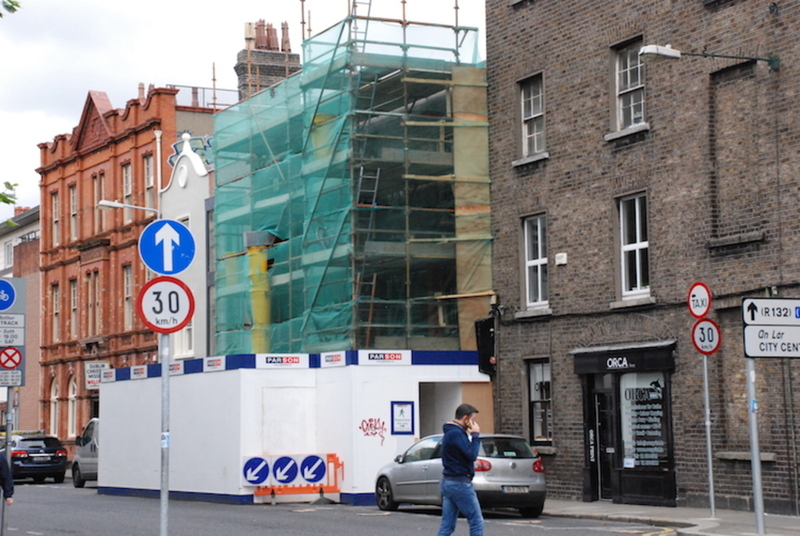 Of particular concern was dogs, according to the DSPCA. 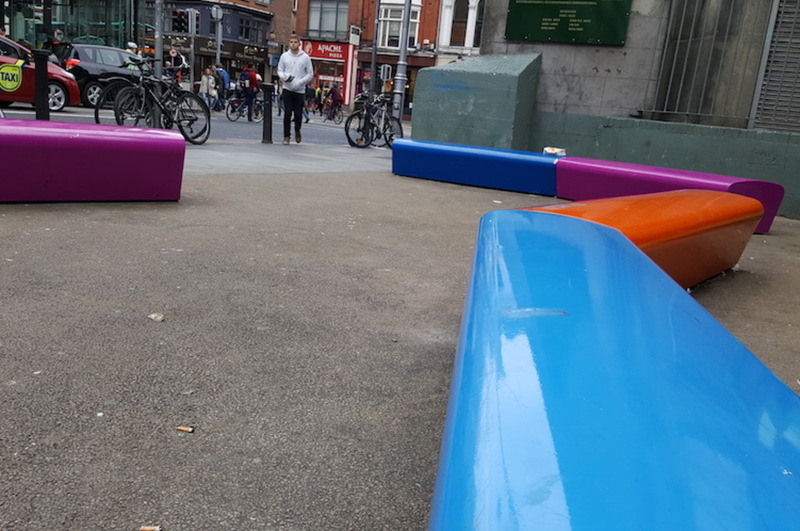 They were also a concern for the Office of Public Works (OPW), which manages the herd in partnership with the UCD Mammal Conservation Unit, regularly thinning the herd with a programme of culls to keep the population at around 500. “People are advised not to come within 50 metres of a deer and to keep dogs under control at all times and to prevent dogs from worrying or approaching the deer as they are liable to be attacked,” the OPW said in a statement Monday. Photo courtesy of Angela Girardi. 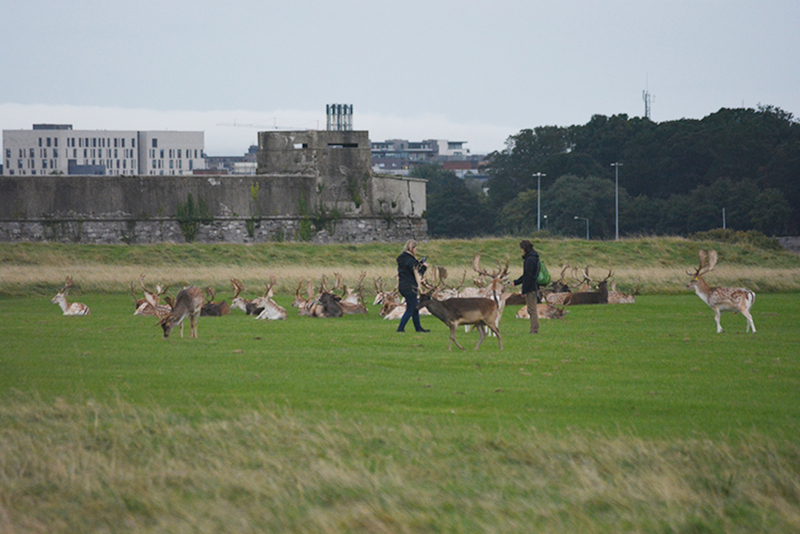 The OPW said it has tried to keep Phoenix Park visitors (and their dogs) at a distance from the deer. “A number of signs are in place throughout the park explaining to members of the public the life cycle of the deer and why the public should not feed the deer,” the state agency said. “Recently, additional signs were erected warning the public not to approach the deer. The DSPCA said park authorities need to do more to educate visitors about interfering with wildlife, and to engage with social media users – and they don’t have to look far to see how it’s done. “They need to do a bit more education, they need do do more proactive stuff with the likes of Instagram,” Bird said. “Our suggestion would be that perhaps … any time somebody tags the Phoenix Park that you could find somebody whose job it could be to just occasionally glance at the pictures and maybe contact the people and say, ‘Look, we do not recommend that people feed or get up close and personal and try and touch the deer,'” said Bird. For its part, the DSPCA has offered to include deer along with foxes in the list of things not to feed that it uses in its outreach programme. “From the [point of view of] the animal’s welfare, it is best to just leave wildlife alone and only intervene if the animal is sick or injured and needs help,” said Bird. Thanks for highlighting this. I have noticed a sudden boom in this kind of behaviour in the last couple of years and find it seriously concerning. What people fail to understand is that they are not the only people feeding these animals and that if they were meant to eat tonnes of carrots etc a day we would see feeding stations full of these items around the park. I think the suggestion of social media monitoring is a great idea, but I also think the OPW need to get tougher and more explicit with people and use conventional media better also, it’s not just the instagrammers feeding or harassing the deer, the worst are the parents with young kids or dog owners who think their little fur baby is the best dog ever. There is no point in saying “we do not recommend…” as people think that doesn’t apply to them or see it as a challenge, instead they need to tell people that they are actually harming the deer, explain the dangers of the deer becoming tame, explain the dangers of letting their children think that wild animals are safe, etc etc And the signs the OPW have put up are so easy to ignore, not least because most of them are temporary signs that fall over when the ground gets soft. In all the years I have been regularly using the park, I have never seen any park rangers around saying anything to people feeding the deer or walking their dogs too close except maybe once or twice in the 90’s, they really should have park rangers near the herds for long intervals at busy times, and randomly, telling people not to do these things until the message gets through. And they need a media blitz explaining all the above too so that it discourages parents BEFORE they’ve told little Johnny and Lily that they’re going to feed the deer. If they don’t get tough now it’s only going to get worse. Not the same possible long term outcome, but its similar with ducks. the amount of people who feed bread to ducks and get pissy with you when you point out to them that its bad for them (I’m looking at you, mam) is bizarre.